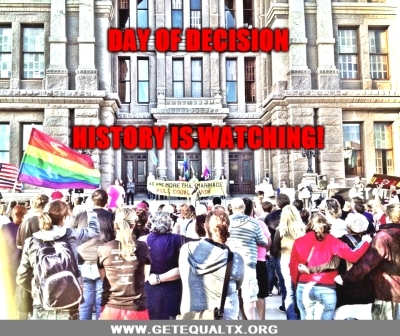 On March 25 – 27, 2013 LGBT Texans and our many allies stood with hundreds of thousands across the nation on the eve of the Supreme Court hearings for Prop. 8 and DOMA. As one we called out for equality! As one we stood on the side of LOVE! As one we entrusted our nation’s highest court with the civil rights of millions of Americans! Now we await their decision. Join us on the day the high court issues their rulings on marriage equality! We will gather again in jubilant celebration of a historic victory for the LGBT rights movement or fierce protest if the justices refuse to extend equality! Wear RED as a symbol of your support for marriage equality! Bring signs, candles, flags, drums, noise makers! Weather victory or defeat- we will be there to light the way to justice once again! To receive details for an event in your area and to be notified when a decision is issued, use the form below.